Copying photos from your digital camera to your computer so that you can work with them in Photoshop Elements is simple if you’re familiar with your camera and the tools at your disposal. 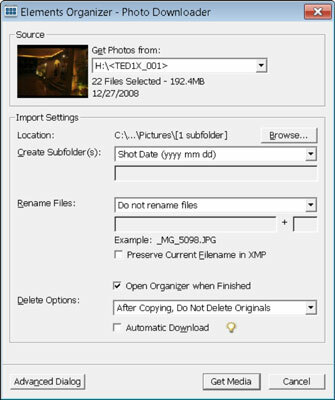 You can use the Microsoft AutoPlay Wizard (Windows Vista/Windows 7) or Adobe Photoshop Elements 9.0 – Photo Downloader (Windows and Macintosh) after you hook up your camera to your computer. When you work with digital photos in Elements, the file format of your images is an important point to consider. You choose this format on your camera before you take your pictures, and the format is carried over to your computer when you pull images off your camera. JPEG: Cameras that produce JPEG images process images with JPEG compression before saving them. It’s as though your camera performs a darkroom method of film processing when the shot is taken. Camera Raw: This format provides you with an optimum image for editing in Elements. When a Camera Raw image is saved to a media source, all the information the sensor captured is saved with the file. Camera Raw also supports higher-bit-depth images than JPEG files do. If you have a choice between just JPEG and both JPEG and Camera Raw, always choose the latter. You have much more editing control over your images, and ultimately, you get better results. Microsoft AutoPlay Wizard may launch automatically when your computer is connected to a media source. You can use the wizard to download images from your media source to your computer. On the Macintosh, you have several options. If you have Adobe Bridge, the Bridge Downloader opens. You can also import photos in iPhoto and from there import photos directly into the Organizer. 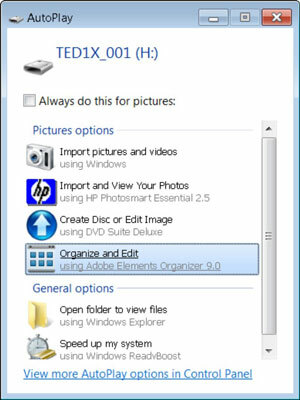 Your third option is to get the photos into the Organizer from a camera or card reader via a menu command. Finally, you can copy files from the mounted media on your desktop to a location on your hard drive by dragging from the media icon to a folder on your hard drive. Hook up the media to your computer. Connect your camera or external media reader to your computer, or insert a media source into a port or drive on your computer. The methods available to you should be detailed in the user’s guide that shipped with your camera. In Windows, you see the AutoPlay Wizard. Click Open Folder to View Files. Follow the steps for copying files to your hard drive. Click the Open Folder to View Files option. Open the folder containing images on the media card. You might find a folder listed as DCIM or another name when you open the media card in Windows. Double-click the folder name to open the folder. Select folders in Windows Explorer and drag them to a folder on your hard drive to copy them to your computer. The images are copied to the target folder. You can set preferences for AutoPlay by clicking the Set AutoPlay Defaults in Control Panel link in the AutoPlay dialog box. When you open the Control Panel preferences, you can choose from a number of options for handling media. The Adobe Photoshop Elements 9.0 – Photo Downloader is installed with your Elements program. Photo Downloader acquires images from digital cameras connected to your computer, from card readers, and from card reader ports on your computer. Click the Organize and Edit option in the AutoPlay Wizard. After the files are copied to your computer, the Photoshop Elements Organizer is automatically launched. The Elements Organizer – Photo Downloader Wizard. To simplify the process, stick with using one tool to acquire your digital camera images — either the Microsoft AutoPlay or the Adobe Photo Download Manager.